News is made when a lawyer becomes a man of the cloth. 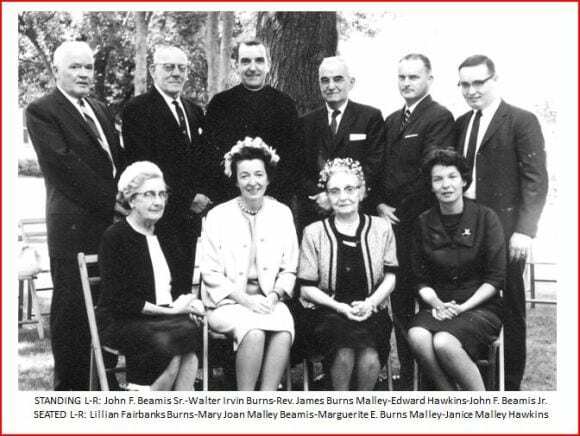 On June 16, 1964, attorney James Burns Malley was ordained a Roman Catholic priest by Francis Cardinal Spellman. More unusual than being a lawyer, Jim’s great-grandfather is Drury Woodson James, an uncle of Frank and Jesse James, making Fr. Jim a first cousin of the outlaws. Fifty years later, Fr. Jim celebrated his Golden Jubilee of 50 years as a Jesuit priest. A year later, Fr. Jim claimed his eternal rest and reward. 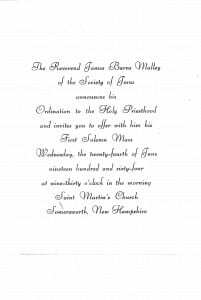 Following Jim’s graduation from Farragut Academy, Dartmouth, and Harvard Law School, his “Alumni Album” at Dartmouth recognized the unusual life and destiny of Fr. 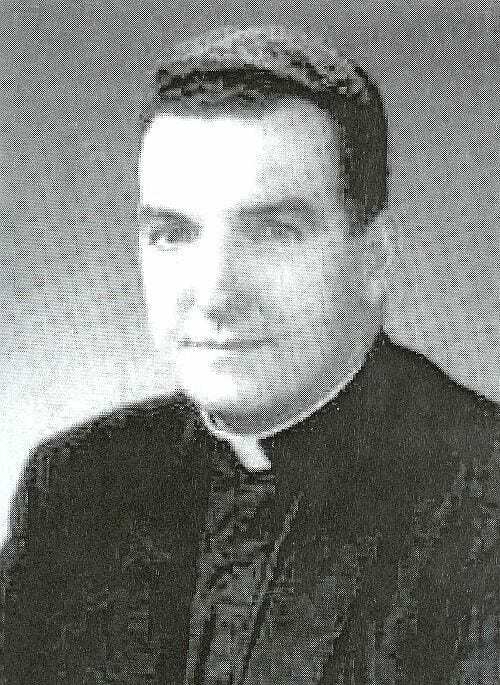 James B. Malley S.J. For the first 15 years, his life followed a predictable course, almost archetypical of the path to be expected of a bright young Ivy Leaguer of a certain vintage. Raised in a prosperous New Hampshire family, James B. Malley ’43 went off to prep school, followed his alumnus father to Dartmouth, matriculating within weeks of a new European war. After an accelerated program, he served three years as a Navy officer, then entered Harvard Law School. He started practice in Boston, was recalled to active duty during the Korean conflict, then worked briefly in San Francisco before joining a Manchester, New Hampshire firm. 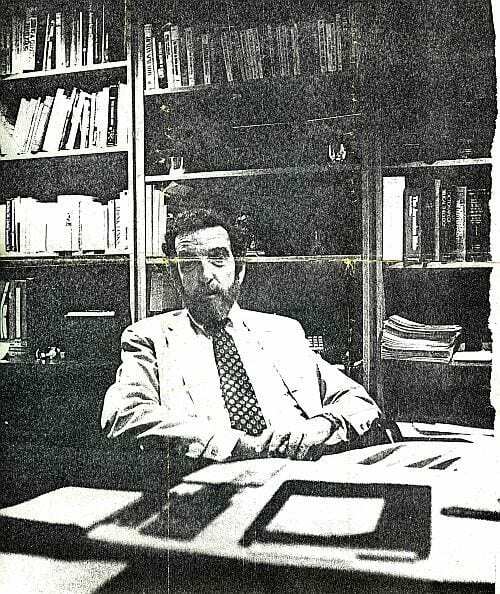 He had settled into a promising career as a tax and trust specialist when not very suddenly, he concluded that “I wanted something more and different.” In 1954, Malley started the long, rigorous training in preparation for the Jesuit priesthood. He knew from the start that he wanted to be an order rather than a parish priest, but he did not have the Society of Jesus specifically in mind until close friends urged him to consider it. Although best known to laymen for their traditional emphasis in intellectual and educational pursuits, the Jesuits have throughout their history functioned in the slums, the missions, and the parishes as well, Father Malley explains. The Catholic presence in South America is terribly exciting, and it is an immensely complex reality.” Father Malley asserts. “It is different from the United States. The people are not church-goers, but in the cities particularly, they are deeply religious in their outlook and philosophy. It’s a cosmic reality. God is active in their lives. Rev. 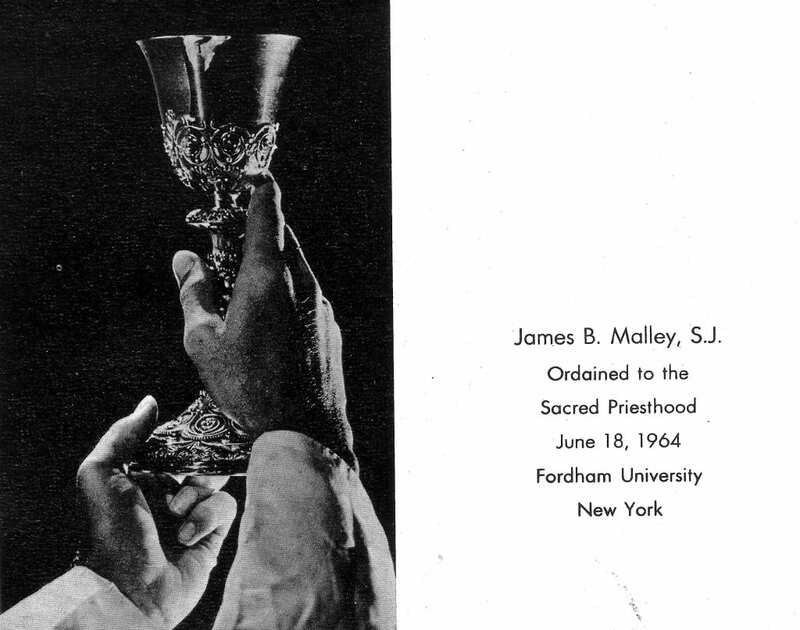 James B. Malley S.J. If it seems a quantum leap also from the oppressive poverty of South America to the impressive hard and software of computer technology, it’s a long way too from commanding landing craft in the Pacific to settling estates in New Hampshire to laying pipe in Brazil. And Father James B. Malley S.J. has demonstrated amply that he’s a good man at bridging gaps. Fr. Malley is prominently featured in the book Jesse James Soul Liberty, Vol. I, Behind the Family Wall of Stigma & Silence, by Eric F. James.